Summer and ice cream, they go hand in hand. Eating ice cream becomes a bona fide activity during the summer (particularly if you have a child) and you feel this need to go out for ice cream and load up like it's going to disappear on you! This is especially the case when you're on vacation; I can almost guarantee you ice cream is part of the day's dietary consumption during a summer vacation. Is it me or does ice cream just taste better on vacation? We were reminded of this on a recent road trip to Newport, Rhode Island. After the time spent touring The Breakers and other mansions, admiring the shoreline and views, the other priorities were to get a good meal and to find some ice cream! We discovered this place, Kilwins, right in the center of Newport, and had a few scoops of fantastic ice cream. Maybe it's the heat and exhaustion of a hot day of sightseeing and the excitement of trying something new but this ice cream tasted particularly good - it almost made us regret the Ben & Jerry's we opted for the day before. Despite all the colorful options and flavors on offer, we're always drawn to old favorites and predictable flavors. We can highly recommend the cappuccino chocolate chip and...the "fudgie brownie" flavor. 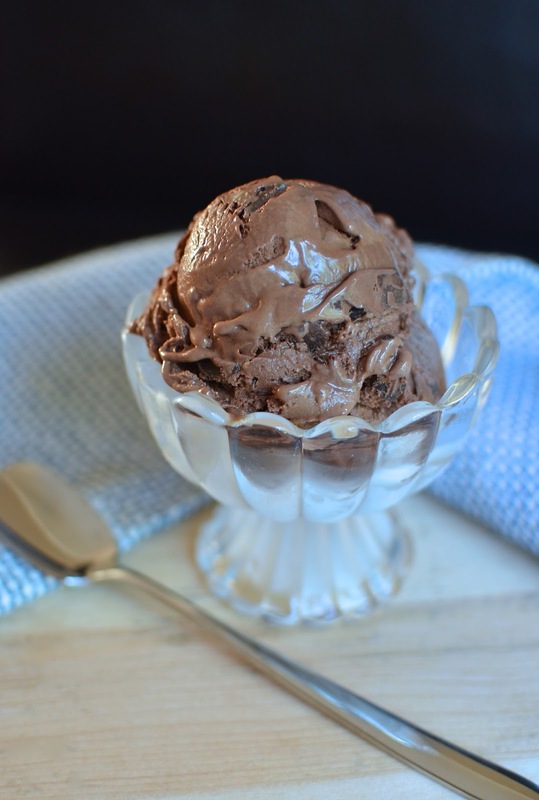 A chocolate fudge brownie ice cream is hardly unusual, I know, but it was so good that we immediately headed back to the counter for seconds once the first cup was done! I knew I had to come home and make a batch myself in an attempt to impress my son. It helps that I make brownies every now and then (okay, very often...) so all I did was set some aside in the freezer for the centerpiece of my homemade fudge brownie ice cream. Maybe ice cream is a bit of a misnomer here. 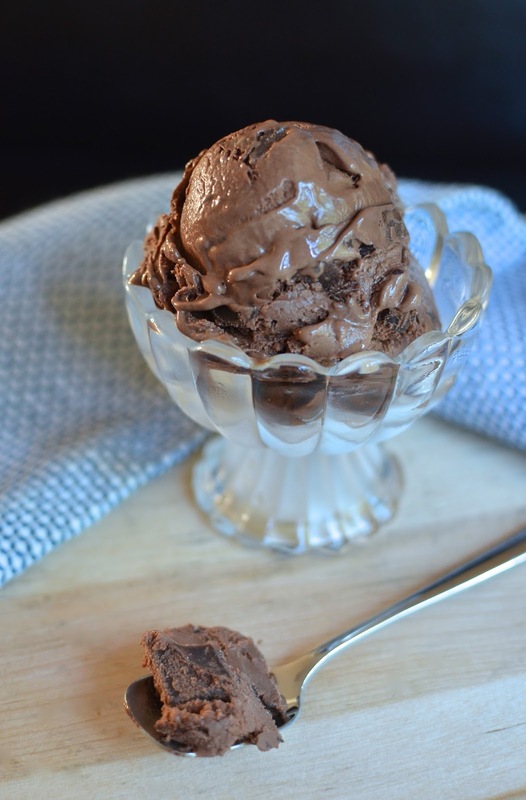 I actually started with David Lebovitz's chocolate gelato recipe, which relies on a milk-based custard, and is one of my favorites because it's rich yet light, without being overly chocolaty and pudding-like. I tinkered with the recipe a bit - holding back an ounce of chocolate in the base to make room for all the brownie and chocolate bits of goodness to be stirred into it - and adding a touch of vanilla extract. So this is my homage to our fun little road trip to Rhode Island and to that delicious ice cream break at Kilwins. It's a creamy chocolate ice cream/gelato with plenty of dense, fudgy brownie chunks (a lot more than Kilwins' had, actually) and some bits of dark chocolate. I wanted to tamper my son's expectations but luckily, it turned out really well. I was told that this homemade version was very much like Kilwins. For my part, I have to say it's really quite good. I won't say it's as good as Kilwins but it definitely holds its own. And here's the fun thing; I looked online and discovered there's actually a Kilwins in New Jersey! I plan to surprise the little guy with a drive out there in a few weeks. He will get such a kick out of that! I adore ice cream and love taking my son out for some and seeing the rapture on his face that I know very well from my own experience. Ice cream is a "weakness" (I use the word reluctantly because I don't like putting any negative connotation to enjoying food) of mine - particularly, if there's hot fudge involved - and once I dig in, it's very hard to stop! One of my "happy places" is a Ghirardelli shop, and we seek out one of their ice cream parlors in every city we go to that has them. That said, it's more of an occasional treat for me these days as opposed to a regular daily summer itinerary, as it often seems to be for my son, because my waistline will stubbornly expand in proportion to what I consume (I'm not sure why my husband seems to be able to have as much as he wants without much consequence). Ice cream is happy food but I'm not devouring big portions regularly like I want to and used to. I'm channeling some of that love for ice cream/gelato by making it at home and learning to savor it in smaller amounts. Making it yourself with care and good ingredients, sharing it with others, is a great way to satisfy your ice cream craving. Then and now, chocolate is my favorite. At an ice cream parlor, my son and I are very alike. It's going to involve chocolate (my husband is more likely to go with a coffee flavor, or a soft serve if that's an option), whether it be a fudge brownie flavor like this or a classic mint chocolate chip. At home, it's fun to play around and make flavors like chestnut once in a while but when all else fails, we point to the classic chocolate. In this case, I started with the chocolate gelato base - it's chocolaty and rich but lighter with milk instead of cream involved. The 4 egg yolks in 2 cups of milk make the base plenty creamy. For the mix-ins, I used a generous cup of cocoa brownies (but you could use more or less to your preference), which are perfectly fudgy and moist for this purpose. I decided to go heavy on the brownie bits and lighter on the extra chocolate chips by adding "just" 2 ounces of chopped dark chocolate as a mix-in. At Kilwins, there were thin chocolate chips in their fudgie brownie ice cream but not a whole lot of brownies to be found in our servings; that said, it was still good stuff! At home, you have control and it's nice to be generous with the mix-ins. I wanted my fudge brownie ice cream to have plenty of fudgy brownie bites inside. I thought that was one way I could distinguish the homemade. It was all so easy to put together, and such fun to find something delicious on the road that you can easily mimic at home to rejuvenate that memory. I know I have a winner when my son asks for this after camp and wants to know how much is left. I have a feeling I'll be making this simple classic flavor for a long time to come. To start, place the 4 ounces of chopped chocolate into a large bowl. In a saucepan, whisk the cocoa, 1 cup of milk, and salt together. Bring to a full boil, then pour/scrape the entire mixture over the chocolate. Stir together until chocolate is melted and the mixture is smooth. Using the same saucepan, warm the remaining 1 cup of milk with the sugar. Stir until sugar dissolves. Whisk egg yolks together in a small bowl. Add some of the warmed milk and sugar mixture to the yolks, whisking constantly while you pour. Scrape the warmed yolks back to the saucepan and cook the mixture over low heat, stirring constantly with a heatproof spatula, until the custard is thick enough to coat the spatula. If using a thermometer, the mixture should read between 170 to 175 degrees. Pour the custard through a fine-mesh strainer into the chocolate mixture. Stir well to combine. Add vanilla extract and stir to incorporate. Let custard cool to room temperature, then cover and refrigerate until thoroughly chilled. Churn custard in an ice cream maker, according to manufacturer's instruction. In the last few minutes of churning, add the chopped chocolate. Stir in the brownie bits (I keep them frozen/chilled) with a sturdy rubber spatula and transfer the ice cream into a freezer safe container. Freeze for a few hours to allow it to firm up. Love that you were inspired to remake an ice cream parlor favorite! You are too kind, Bonnie...thank you! Your creations are the things that are amazing. Happy moving and enjoy your new home! Yummy Monica! One of my all time favorites - nothing like those chunks of brownie. Glad you had a good and memorable vacation and some good dessert too! Nothing like lots of sun, sea, and ice cream thrown in. : ) Hope you are enjoying every ounce of summer; it's been a nice one! Ice cream is my favorite summer treat and I would have a big bowl every day if I could too :) Love this fun flavor, it looks so rich, chocolatey and delicious! We took our kiddos to the fair yesterday and sampled so many flavors but I'm still craving a big bowl of this right now :) I'm with you, ice cream tastes extra yummy when you're on vacation. Hope you guys had a great time! Wow! 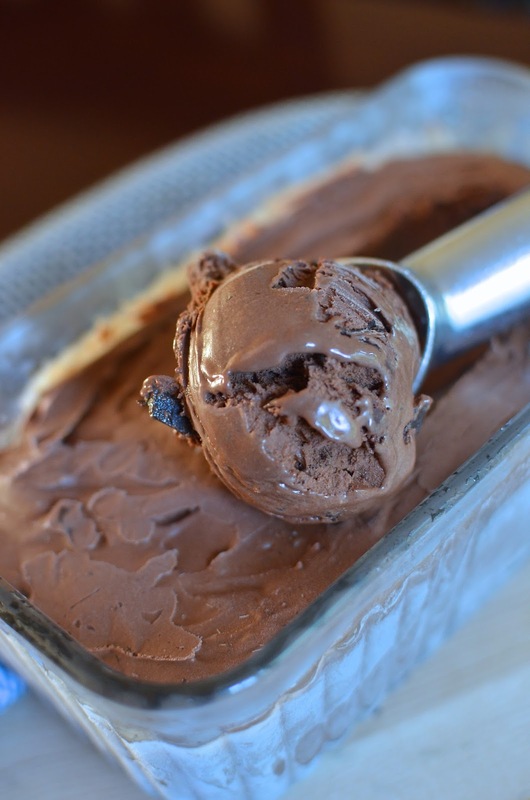 This is DROOLICIOUS chocolate fudge brownie ice-cream. Looks so rich, creamy, classic and full of chocolate goodness. YUM! Classics are the best sometimes. Thank you! Fudge brownie in ice cream form...life couldn't be better, could it? This looks heavenly, Monica. Chocolate AND fudge together? You just make my favourite ice-cream! Absolutely delicious! Ill certainly be making this! Tell me about it! I used to eat so much ice cream, girl! Sigh...time flies, we get older, and things do change...but we can still enjoy in a bit more moderated way. I am so glad to have a chocolate-fan here. I don't think you'd ever catch me going for an ice cream flavor without chocolate in it in some form! I've definitely learned to savor smaller servings of ice cream! Both for my hips and the fact that large quantities of it don't agree with me like they used to!! So sad haha This chocolate flavor sounds completely fantastic. I've seen a few Kilwins when I've been on various trips ... might have to stop in the next time I see one now!! I so agree. It's like you get to relive a happy moment over again. : ) I'm sure you're going out for plenty of ice cream but do make a batch at home if there's time. Enjoy the weekend and these dwindling summer days... Thanks for coming by! Vacations and Ice cream...yessss! I agree with every word. About flavours, even if I am always open to trying out the exotic-est of flavours..nothing satisfies like the classics. Your ice cream looks like perfection..luscious, creamy and mouthwatering good! I feel like I've been eating ice cream like it is its own food group lately!! And I'm totally okay with that. Love how intensely chocolatey this is! That's exactly the sentiment! haha. Hope you're having a great summer! I did have a piece of cake for breakfast the other day... : ) I'm making more ice cream this week...can't seem to stop. I love homemade ice cream! I made a batch a few weeks go and we demolished it so we said "no more ice cream!". But now I see this recipe and I'm thinking... more ice cream! Your ice cream looks amazing - so rich and full of flavour!